Once again we were lucky to have Sadie Nardini and Tyler McCoy back at our studio! We participated in a 3 hour workshop where Sadie talked about her new book 21 Day Yoga Body. It was great hearing her insight about the book and why she was inspired to write it. I was super bummed being sick I couldn't participate in the class, but that gave me a chance to take some photos! 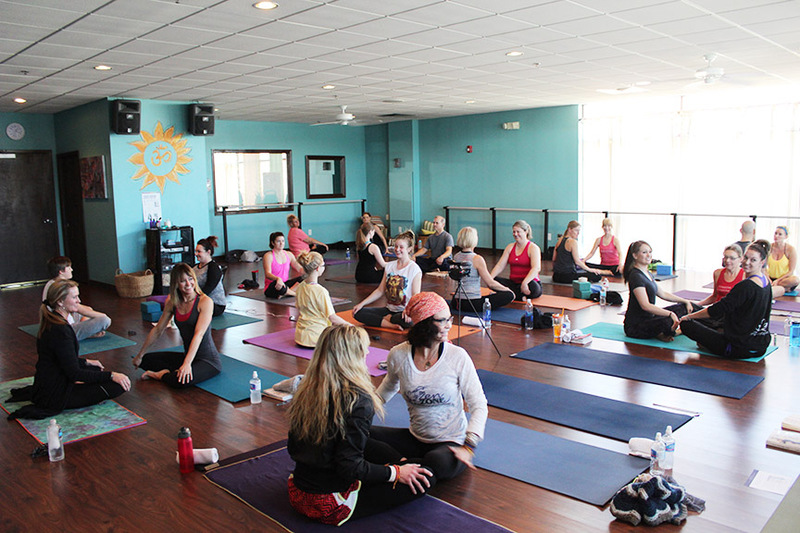 We had our mustaches ready for Tyler and it was a great afternoon for some yoga and laughter! I can honestly say that a yoga class is one of the hardest things to photograph. As you can imagine people are in positions that I am sure they wouldn't want photographed, but yet there are opportunities for some really beautiful shots as well. The form that a body can create is a pretty amazing thing! It's always a challenge to get interesting shots. I'm slowly learning what works and what doesn't! "Wherever you are is the perfect place to do your work." "The universe is far more creative than you." These are two quotes out of many that I wrote down from the group conversation with Sadie and Tyler that stand out to me. I enjoy the first because I have felt that the last couple of months traveling. I think you can take it literally, but it also means that you shouldn't make excuses. Do what you want with what you have where you are. The second is pretty self explanatory... we are always learning from what is around us!